UNI-FIT slings are available in your choice of “standard” cloth polyester, “H” cloth, which is high-heat polyester that withstands temperatures up to 200°. “Mesh” a polyester material (for bathing). You may also choose “C” cloth a cool-heat polyester that withstands temperatures up to 167° and has a non-absorbent coating on one side for easy spot cleaning. All slings and belts are also available in a disposable material to help with infection control and cross contamination issues. There are many different custom options available. Please contact Vancare or a local distributor to discuss your concerns and options. 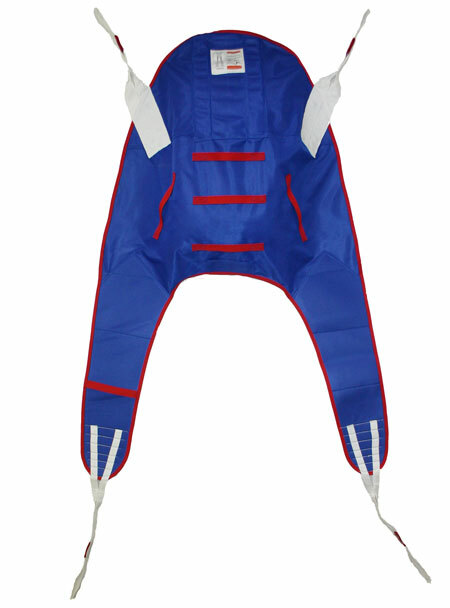 UNI-FIT SLINGS should be long enough to fit from the bottom of the patient’s coccyx to the top of, or a few inches above, the patient’s head and wide enough for sling fabric to extend at least two inches in front of the patient’s anterior shoulder. Measurements are from the top of the head support to the bottom of the horseshoe area.